Adam Mangan races with his wife at Datchet. Adam is a Technology hot-shot and works in Banking. They race their 1998 boat all year round, at Datchet and on the National Circuit. Adam and Emma are keen participants in regional championships and have raced the boat in Ireland too. They have a very competitive setup and in the interview below, we ask Adam why he chose a Flying Fifteen and how to go about buying one second hand. I sail with my wife and she is very competitive – we had to have great boat-on-boat racing. The choice on the market is enormous, of course. You can choose SB3, Squib, K6, Elite, Dragons, Sonatas and so on – but it doesn’t have to be that difficult. If you live in Greater London and like the convenience of racing two up, want easy launching, then a Fifteen at Datchet is just the obvious choice. We enjoy racing “the circuit” as well, and Datchet is a super base location for that. It has a really useful Purple Marine chandlery onsite for buying those odd little bits during the year. Additionally, Datchet has a “Trial Sail” capability. Usually at most Clubs this means going out for a ride with an existing member. At Datchet, it’s much better than that – they have 3 loan boats in the pool(sic) and you can rent one for a nominal fee – for a day, a week, a whole three month race series maybe. It’s a highly recommended way to get to know what you want before you buy. Read about it on the “Trial Sail?” tab of this website. Since about 1990, there has been a revolution in build quality. The boats stay competitive for years – you don’t have to buy new to get a good boat, and depreciation is very low. The cost of ownership gives great value sailing. We chose a 1998 boat – it still looks great and gives excellent racing. The market is very active in this class. At any point in time really, there is a good choice of all boat ages – sometimes within your own club. Usually, you don’t have to travel far to view them either. Usually the choice is huge. You can easily see the prices and boat age there, and it’s the default way for sellers to advertise their boat. The first thing to look for is good physical condition. Is it clean and sound? Cast an eye along the hull and see if you can spot ripples or poor repairs? Does the hull seem firm around the shroud area? Maintaining the keel can be daunting, but usually if the boat has been looked after, they are maintenance free for a decade or more. Look for rust marks, dents at the lower forward edge (check the rudder too) and visually inspect the seal to the hull. Inside, does it look clean and if fittings have been moved around over time, have previous positions been made good. Look for cracks along the hog, and check inside the tanks to see how dry they are. Very importantly, do all the control lines run smoothly. Lastly, check out the trailer. It’s an expensive piece of kit. We launch and tow from the same trailers at Datchet, so it’s important that the trailer is good. Having a design where the keel platform is low is really helpful in most launching situations. We also like a generously sized V-support at the bow – it makes recovery in waves so much easier. Rock the wheels to check for bearing wear? Does it rumble when towed? (Bearings are easy and cheap to replace). Is all the padding secure to keep the hull safe during recovery? Is the jockey wheel is good order (a new one is about £40) and when you lift the boat at the hitch does it feel too light? Check to see if there is an under-cover and lighting board included in the sale. You need to check with the previous owner how he attached the lighting board when towing. Over time, we’ve done some upgrading on our boat to keep it modern and up-to-date, but you don’t have to. The first thing to consider is new sails, and perhaps replacing some control lines. Check out the covers too, but take it steadily, as you might be throwing money away. Call the fleet insurance company, JK Lee, and check the insurance situation, and make sure you know what your club fees are going to be. Datchet fees are very competitive actually. In a decent sized, mixed ability, fleet like Datchet (20-30 boats), you are always going to have someone to race beside. Our current Club Champions sail a five year old boat, …not that we can actually sail beside them!! You might like to specifically choose a Silver or Classic category boat. Classics have not caught on too well at Datchet, but we have exceptionally competitive Silver Category members there. The Silver category boats have sail numbers in the 2701-3400 range. There was a big step up in boat quality, speed and longevity from around 1990 onwards. 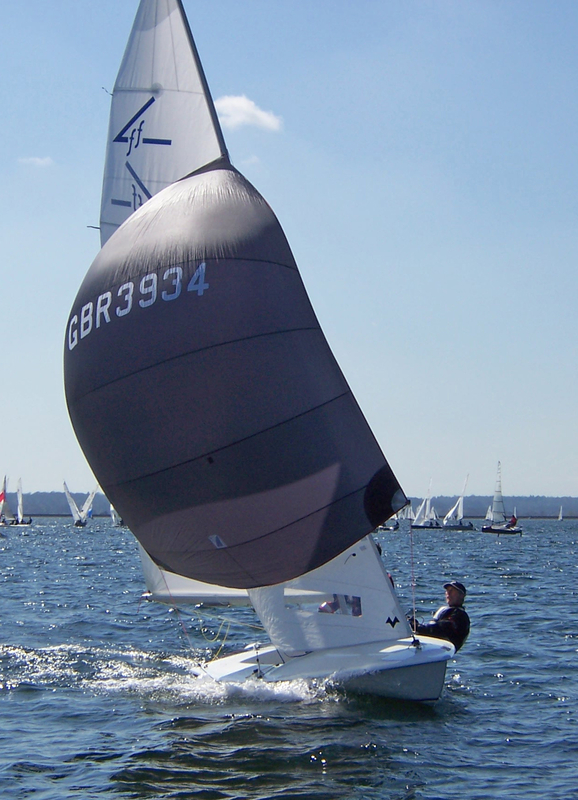 Any sail number from around 3250 upwards will give you some cracking racing. Our boat is 3653 and is 1998 vintage. It’s as quick as anything else out there and we can win Club trophies with it. If you buy a Mark IX like we did, then it doesn’t need much looking after at all. The occasional thing might break or wear out, but I worry about me wearing out sooner than the boat. We don’t really bother with annual maintenance or anything like that – just tinker a little as we go along. It’s not a nightmare or anything !! The answer is the same for everyone really – you advertise on your Club noticeboard and on the National FF website for a nominal fee. It seems to work well for sellers and buyers alike. If the boat is older, say numbered below 3250 or especially below 2700, you might want to contact some of the Clubs who specialise in Classics and Silvers directly and get an advert put on their notice boards. Often good Classics sell like hot cakes frankly – and they don’t really depreciate. They can even appreciate in fact. If you have a “modern era” boat, say 3200 and above then there is good market and selling them on successfully does not seem too difficult. Depreciation is much lower than many manufacturer driven classes – they are really not expensive to own over a period of a few years.